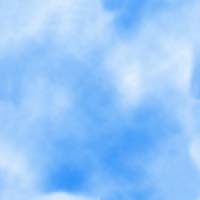 These graphic files are large and will load slowly due to size. Patience please. Hystrix patula, a native woodland prairie grass that will thrive in moderate shade. The seedhead resembling a bottle brush could be confused with Virginia Wild Rye when first observed, but for the spaces between the flowers and the outward direction where they point. It enjoys medium to dry well-drained soils and grows 3'- 5' tall. 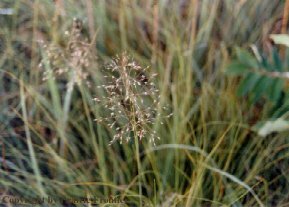 Sporobolus heterolepis, is one of the most attractive warm season prairie grasses that is very drought resistant. 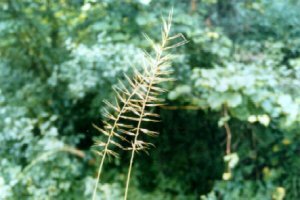 This bunch-grass produces a fountain of slender leaves that are green in the summer and changes to a golden rust during fall. The leaves are up to 20" long and normally less than 1/8" wide. While flowering it is fragrant and it does not tolerate heavy grazing. Spartina pectinata, or sloughgrass, is common in the poorly drained soils or wet prairies and prairie marshes. 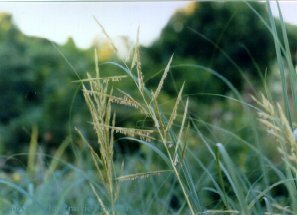 Prairie Cordgrass has tough thick stems which is reflective of the name and the coarse leaf blades can be quite sharp. Each stem has a long cluster (spike) of branches which holds the individual flower spikelet. This plant spreads agressively by rhizomes and turns golden-yellow in the fall. 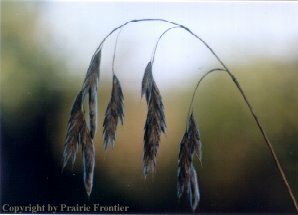 Bromus kalmii, is a cool-season grass that can be found growing in small clumps as well as individually and grows 2'- 3' tall. The soft drooping flower heads hang from slender stalks at the top of the plant. Prairie Brome does well in moist to mesic soils. Panicum oligosanthes scribnerianum, is a cool-season grass that has low laying branches and produces reddish-purple stigmas that are covered with fine hairs. It is a member of the Black Oak savanna and sand prairie and cannot tolerate grazing. Glyceria canadensis, a warm season native perennial that reaches 1'- 3 1/2' in height. 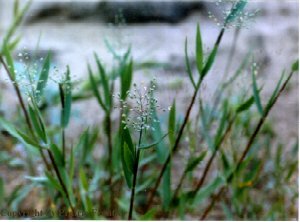 Fat green flower clusters droop on slender branches of this grass which enjoys moist to wet conditions.